Get Your Free Collectable Bandana at the Parade this Saturday! Our 25th Anniversary bandanas look incredible, don't they! Designed by Tricia Felix, these gorgeous blue, yellow and red bandanas are specially for our parade attendees. This is our way to thank you for joining us!The parade will be held on Saturday, August 11, 2018 at 11 AM from the SF Civic Center, along Market Street towards 4th Street to Yerba Buena Gardens. The commemorative bandannas will be given away for free (while supplies last) for members of the public who come out to watch the Parade at Market and 7th Streets. This year's Pistahan Parade's Community Grand Marshal is Daly City's first Filipina Mayor Juslyn Manalo. Mayor Manalo has served as the Vice-Mayor over the last year, following her election to the Daly City Council in November of 2016. The City Council selected Manalo to serve as Vice-Mayor after being sworn in as a first-time council member on December 5, 2016. Prior to being elected to the City Council, Mayor Manalo was a member of the Daly City Personnel Board. She was raised in Daly City and is a graduate of Jefferson High School. 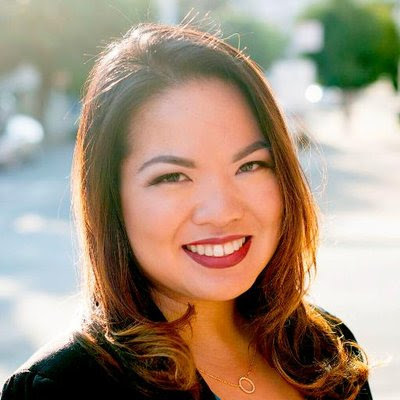 She earned a Bachelor's degree in Asian American Studies and a Masters of Public Administration at San Francisco State University's School of Public Affairs and Civic Engagement. Jennifer Cabalquinto, CFO of the Golden State Warriors, is one of the highest ranking Filipinas in the corporate world. In her role, she oversees all day-to-day and long-term financial planning and accounting for the organization. With over 20 years of finance leadership experience in a variety of start-up, turnaround, and high growth business environments, Cabalquinto most recently served as vice president and chief financial officer for Universal Studios Hollywood since 2007. Are you a current high school or college student? This is your opportunity to meet and mingle with various Filipino-American collegiate organizations from around the Bay Area. This is a chance for you to network with those who will be there to enrich your academic life while you finish your studies. Check out the college kids and groups at our Leadership Pavilion across Mission Street in Jesse Square. Various Fil-Am college organizations will also be representing at the Pistahan parade on Saturday, Aug. 11. Nayah Damasen is a 13 year-old singer, actress, and dancer. She is a Bay Area Native who has been singing since the age of 2. Nayah has sang the National Anthem for many professional sporting events such as the 2018 NBA Finals for our Champions, The Golden State Warriors, which was televised worldwide, Oakland A's, SF Giants, SF 49ers, Oakland Raiders, and The America's Cup. As an actor, Nayah appeared as Kimmie on ABC's Grey's Anatomy, Modern Family, To Tell the Truth, Nickelodeon's Henry Danger and in a feature film called, "How To Be A Latin Lover." Nayah will be making a Guest Star appearance in Disney's Bizaardvark sometime in October. On November 3rd, she will be singing with FASO, the only Filipino American Symphony Orchestra outside of the Philippines at Alex Theatre in Los Angeles. She is currently working with Multi-Platinum Grammy & Emmy Award winning Producer/Musician/Recording Artist, Narada Michael Walden on her first EP. Get Your Groove on at the Pistahan Dance Pavilion! Tita Florence, Ninong Johnny and their house DJ are at it again this year! Make sure you visit the Dance Pavilion at Pistahan above the Yerba Buena Gardens waterfalls and take part in their workshops and programming! Ruby Ibarra's debut mixtape Lost in Translation has accumulated over 50,000 Soundcloud streams and nearly 100,000 digital downloads. She's been featured on Buzzfeed, NPR, and Huffington Post, while having the opportunity to perform on large stages such as Rock the Bells Festival, Paid Dues Festival, and Araneta Coliseum. Additionally, in 2016, she had three independent videos each gain over 1,000,000 views in less than one week. Catch her on stage Sunday, August 12! Proudly presented by our partner Kaiser Permanente, various medical services will be offered, including glucose screenings, blood pressure screenings, "Talk with a Doc Consultations", healthy living tips and disease-prevention info. Get a reward upon visitation of all service tents by filling out the health passport! Get healthy and thrive! Check us out on Adobo Nation! Pistahan Parade and Festival: 25 years of "Celebrating our History and Creating our Legacy"
San Francisco (July 29, 2018) — In its 25th milestone year, the Pistahan Parade and Festival is expected to once again draw tens of thousands of people throughout the weekend of August 11th and 12th at San Francisco's Yerba Buena Gardens. This year's overarching theme is "Celebrating our History and Creating our Legacy,” as we look to honor the predecessors in our community whose shoulders we stand on and honor the past struggles and successes by the Filipino community. We hope to celebrate our long rich history of struggles and triumphs while also acting as innovators in setting a course for the future, exhibiting a strong voice and sense of cultural pride in our roots. Organized by Filipino American Arts Exposition (FAAE), Pistahan is one of the marquee annual events in the SOMA neighborhood which has been designated “SOMA Pilipinas” – a Filipino Cultural Heritage District. Taking place on Saturday, August 11 the Pistahan parade will begin with a 10 a.m. ribbon cutting ceremony at the San Francisco Civic Center. The parade will begin at 11 a.m. and proceed from Civic Center along Market Street to Yerba Buena Gardens. Among those featured at the parade will be two authentic Philippine jeepneys, San Francisco cable cars, a brigade of Star Wars stormtroopers, Philippine cultural dance groups, marching bands, a human Philippine Flag contingent consisting of Filipino American college student groups from around the Bay Area, and more. On the sports side, Golden State Warriors, San Francisco Giants and Oakland Athletics Super Fans will gather to form another contingent with Stomper, the A’s mascot leading the way. 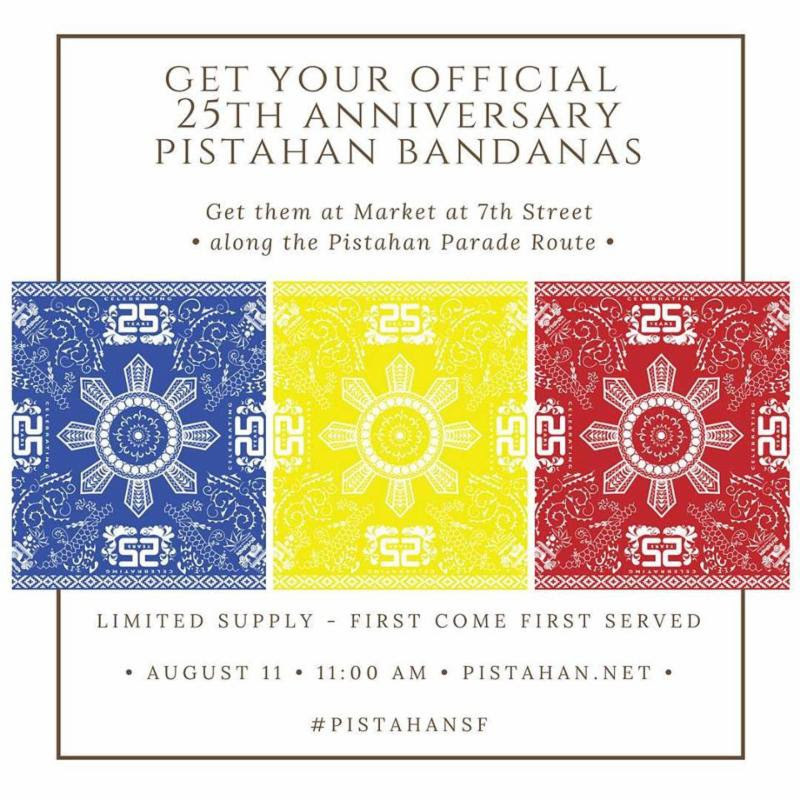 Pistahan 25th Anniversary commemorative bandannas will be given away for free (while supplies last) for members of the public who come out to watch the Parade at Market and 7th Streets. This year's Pistahan Parade's Community Grand Marshall is Daly City’s first Filipina Mayor Juslyn Manalo. Joining Manalo will be Jennifer Cabalquinto, CFO of the Golden State Warriors, one of the highest ranking Filipinas in the corporate world. Pistahan’s Hermano and Hermana mayors this year are John and Rebecca Delgado-Rottman. John is a Superintendent at Hathaway Dinwiddie, who just completed building the Salesforce Tower, the tallest building in San Francisco. Rebecca is a trailblazer in the Filipino American community, and was the first Filipina elected in a city-wide election for the SF Democratic County Central Committee. She recently retired from the Academy of Art University as VP of Community and Government Relations. Yerba Buena Gardens will offer festival goers a variety of fun and interesting activities, and world-class performances at the Main Stage. Headlining this year’s entertainment are artists traveling all the way from Manila: Martin Nievera and Darren Espanto. The Festival will also include cultural dances, talented singers, and delicious Philippine cuisine. There will also be many exciting products offered from various festival vendors throughout the weekend. In addition, the festival has organized seven interactive pavilions celebrating Philippine culture, which are sure to attract the diverse tastes and interests of the public: Art, Culinary, Dance, Sports, Health, Innovation, and Leadership. For those looking to quench their thirst, the Pistahan Tavern will have refreshing beverages including San Miguel Beer, wines made by Filipino wineries, lambanog (Filipino moonshine) and hard frescoes. The Pistahan Parade and Festival at Yerba Buena Gardens in San Francisco continues to deliver excitement and entertainment, create memorable experiences and bonds among communities, expand horizons, and above all, inspire pride across the generations of Filipinos in the San Francisco Bay Area. "I am so proud to be a part of the Pistahan because it is a true embodiment of the Filipino bayanihan spirit,” FAAE President and Pistahan organizer Al Perez said. “The whole event is organized by an all-volunteer group of amazing, dedicated individuals who are passionate about preserving and sharing our heritage and traditions. I would like to invite everyone to come out and check out the Pistahan Parade along Market Street and celebrate our Pinoy Pride!" Support THE premiere Bay Area Filipino event and connect with the largest Asian ethnic group in California! Maximize of our many branding and marketing opportunities. For details contact: Al Perez, pistahansf@gmail.com, 415-625-EXPO (3976). Get your group together and show your Pinoy Pride! Prizes will be awarded to the Best Spirit, Best Dressed, Best Spectacle, Best Performance and Best Overall. Pistahan founders and planning committee alumni members are invited to join the 25th anniversary reunion, be at the vanguard of the Parade and carry the lead banner when the Parade begins at 11 am. To participate in the Parade, fill out the form online: www.pistahan.net > Get Involved > Join the Parade. Volunteers are needed in the weeks leading up to the Pistahan, and on the day of the event. Join the dynamic Pistahan Volunteer Crew, share your unique talent and skills, give something back to the community and meet lots of cool people who are passionate about promoting the best of Filipino culture. Fill out the short Volunteer Survey at www.pistahan.net > Get Involved > Volunteer. 11 a.m. – The Pistahan Parade begins at the San Francisco Civic Center and will continue along Market Street towards 4th Street, then disembarks at 4th and Mission Streets.